Action Figure Barbecue: Hokey Halloween Horror: Do you paint your pumpkins or carve them? Hokey Halloween Horror: Do you paint your pumpkins or carve them? This is a Halloween picture from probably 1990. 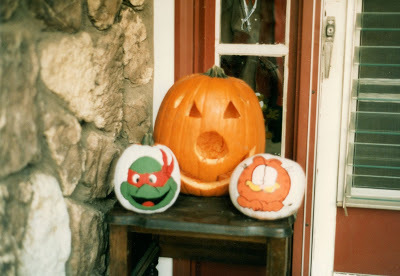 That year we had a mixture of painted pumpkins and carved pumpkins. I'm more of a carver, though, and always carve my pumpkins now. What do you do? Carve? Paint? Something really cool I've never heard of? Share it with us! Only maniacs paint their pumpkins. Those who don't carve one when they have the choice needs to be culled from the human race. I love you and your strong opinions, Cal! I'm in favor of always carving, too, but don't tell me you would pass up a pumpkin if someone painted a picture of Batgirl on it! I know that's not true. We carve ours every year. My daughter even used a drill and made flowers one time. Very cool. By the way, your site is great! I love your yard display and the graveyard pictures. I geocache and always love discovering off the beaten path cemeteries in my travels.